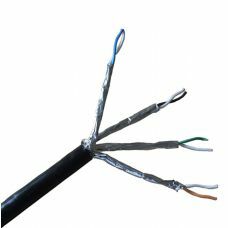 External Category 6A Screened (F/FTP) Cable is designed to offer performance with the protection to allow it to be installed externally. Ideal for connecting external equipment such as IP Cameras or Wireless Access Points using a cable that can be installed into external ducts and pathways.Each cable consists of two sets of two pairs are wrapped together in an "S" configuration with high quality, strong, aluminium/polyester foil tape providing screening for each pair. The "S" Foil configuration ensures separation of the pairs that ensures the performance. The individual pairs are set to different lay lengths to ensure optimum performance. Supplied by the metre and in 305m boxes.